Today is a good day! In addition to hearing the news that Barnes & Noble is going to begin carrying self-published books in their stores, Elsie Earl Studios has started an Indie Book Club! And none other than my Skin of the Night has been selected as the club’s next reading on July 19th! 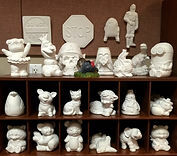 3-D Painting (plaster figurines, trinket boxes, wall plaques. Same-day take-home). And now we may add to that list of fun an Indie Book Club! You may RSVP for Indie Book Club on facebook here! Signed copies of Skin of the Night as well as my first book Blood & Alcohol are available for purchase at the studio at a discounted book club member rate offered nowhere else. You may also pick up a free copy of the 2016 #IndieBooksBeSeen catalog. This catalog will be used as a tool to choose future book club reading material as decided by the club members. Please note I will not be present at the July 19th meeting. I want people to feel free to discuss the book openly and develop their own impressions of the material. Due to my book being a 40 page graphic novella, the story will be read by group members at the meeting. Don’t forget! Tomorrow is Indie Book Club at Elsie Earl Studios in Ann Arbor! Discounts on my books for club members. “Skin of the Night” will be read and is available at the meeting!